Every year The Intersection (formerly Urban Seed Education) speaks to thousands of school students, leading interactive walks around the city and running creative workshops that address homelessness, addiction, reconciliation, colonisation, diversity and the need for empathy and connection to respond to these issues. The Intersection's attraction is its hands-on experience with issues of homelessness, marginalisation and street culture that allows it’s experienced educators and facilitators to share anecdotes and stories that bring urban issues alive for students, help break down stereotypes and promote consideration of the risks associated with alcohol and drug abuse and wider cultural issues. Schools can book individual sessions, and we are also able to combine several sessions over one or more days as part of a retreat day or city experience programme. See below for a list of walks & workshops on offer. For enquiries & bookings information email bookings@theintersection.org.au. The fees for our walks and workshops support the work of The Intersection and are necessary to help cover our costs, however we do not want them to be prohibitive. Please contact us if you would like to discuss this further. Our work has shown us that our instinct is to find connection with people who are alike us and we agree with, but this creates a sorting effect and therefore disconnects society from each other. 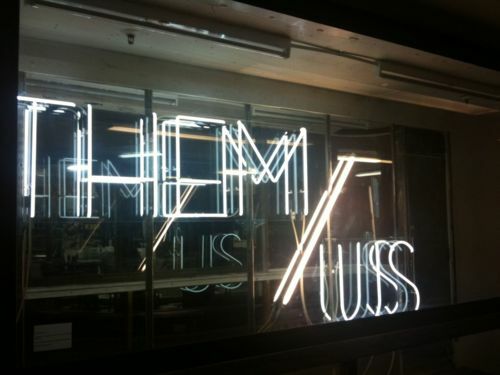 Many of us live with an Us and Them mentality; you are either with us or against us. We wonder if this is one of the reasons why 1 in 4 Australians are lonely? Why homeless has increased by 14% since the last census in 2011? And why 65% of Australian’s don’t trust their neighbours? At The Intersection we believe that our prosperity lies with the other. That connection and empathy are vital. We find that up close people are hard to hate and that strangers become fiction. There is power in intersecting with the other, because difference is our teacher, and diversity is our strength. Please email bookings@theintersection.org.au for further information. Drawing on The Intersection’s 20-year history of living in the neighbourhood of Melbourne this walk takes students on a journey through different perspectives of our beloved city. As we make our way through a number of spaces we will invite observations and tell stories, capturing students imaginations by displaying how positive change in society is actually possible. We will unpack the themes of stereotyping, inclusion/exclusion and power; and discuss issues such as homelessness, addiction, mental health and disadvantage. We will ask, who is the city really for? And how can we create a society for everyone - where everyone belongs. This walk runs for 90 minutes and costs $425 (plus GST) for a group of up to 30 students. The fees for our walks sustain the educational and community work of The Intersection, and are necessary to help cover our costs, however we do not want them to be prohibitive. Please contact us if you would like to discuss this further. For enquiries & bookings information email bookings@theintersection.org.au or make a booking request. Empathy is the ability to step into another’s shoes. To look at life from an others perspective. It is more than just sympathy. As by truly imagining and looking at life through someone else’s eyes, we may begin to see as they do. The unknown stranger becomes known. And perhaps we may see that we are the same. Because of this, empathy has the ability to be a tool for social change. Some may even say that it has the power to transform ourselves and some of the biggest issues facing our society. ie poverty, violence etc. At The Intersection, we strive for an empathic world. We have sought to meet the stranger (homeless / addicted / marginalised); to imagine what life is like for them, and have begun to see ourselves in them and discover our shared humanity. We invite you to step into an others shoes and see life from their perspective. This session will draw on the ongoing empathic work of The Intersection to challenge and inspire students to not only have empathy themselves but to gain an empathic vision for the world. This session runs as a 90 min workshop and costs $395 (plus GST) when hosted at our CBD venue. It can also be offered onsite at your school or other venue for $445 (plus GST) — a discounted price available for multiple bookings on the same day. It is highly recommended that groups also participate in our “A Most Liveable City” walk, and compliments our Laneway Cricket & "you+me+us" workshop. Please contact us if you would like to discuss this further. For enquiries & bookings information email bookings@use.org.au or make a booking request. We sort ourselves into like groups, allowing us a sense of belonging and connection with like-minded people. But this can also create a division of 'us and them' and a mentality of, you're either with us or against us. At The Intersection we believe that right now we need to not live in a divided world and that we need to embrace difference and diversity for our own growth, health and healing. In this workshop, we will begin to re-humanise the other, through a series of interactive activities, media and discussions. Discovering that people are hard to hate close up and that strangers really are fiction. This workshop runs for 2 hours, costs $359 plus GST, and is only on offer to those students who have participated in a "A Most Liveable City?" walk and compliments our "Empathy" workshop. 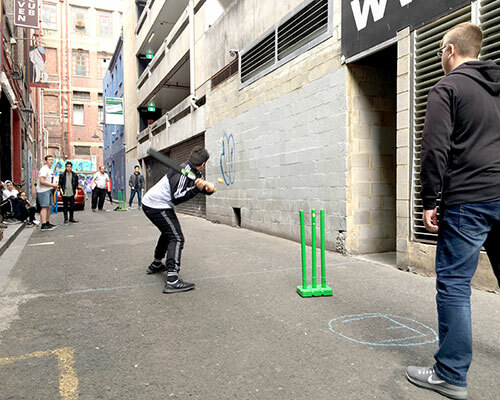 All bookings of ‘A Most liveable City’ walk can now be paired with our newest Laneway Cricket session (only available terms 1 & 4). We ask, what happens when different people come together to play sport? The answer: barriers, assumptions and stereotypes get removed and broken down. No more are we a homeless person, business person or school student, we are just people; neighbours sharing a game a cricket. 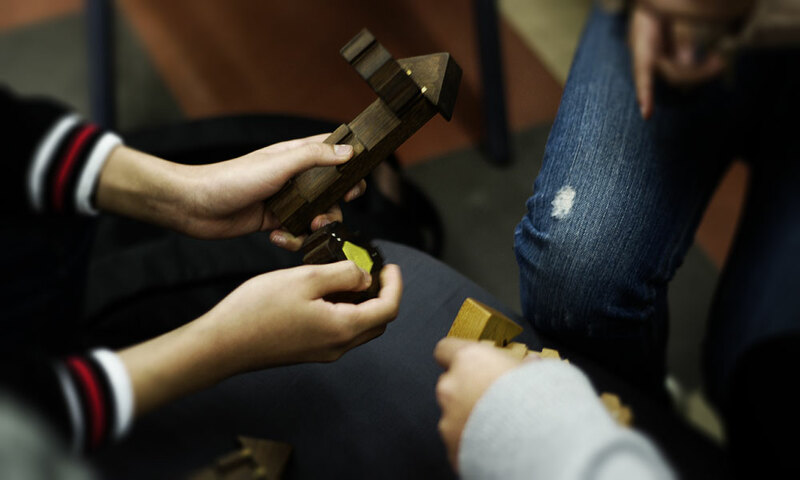 Umpired by one of our oldest friends who has struggled with many of the issues discussed in our walk, your students will undertake a challenge to meet the other through the natural intersection of a Melbourne Laneway, a plastic cricket bat & tennis ball. They will be challenged to actively practice empathy in the city and be inspired to continue practicing it in their own school and neighbourhood. This workshop runs for 90 minutes or 2 hours, costs $445 plus GST, and is only on offer to those students who have participated in a “A Most Liveable City” walk. 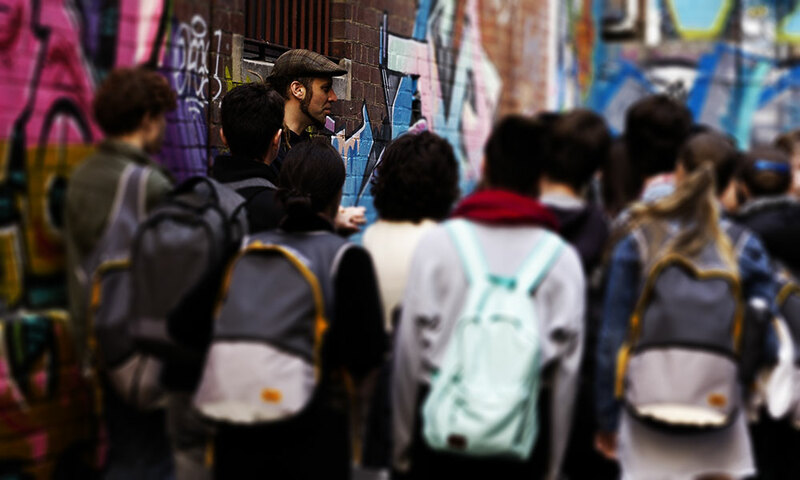 It also compliments our "Empathy" workshop. .
Melbourne is world renowned for graffiti and street art. It is controversial, irreverent and subversive. Graffiti is historically vandalism and is now seen as the ‘art’ of the outsider. The graffiti and street artist is a vandal with creative resistance to authority, giving them an outlaw status. Its position in society is on the margins, as graffiti, protest and aesthetic invention all oppose authority and the status quo. 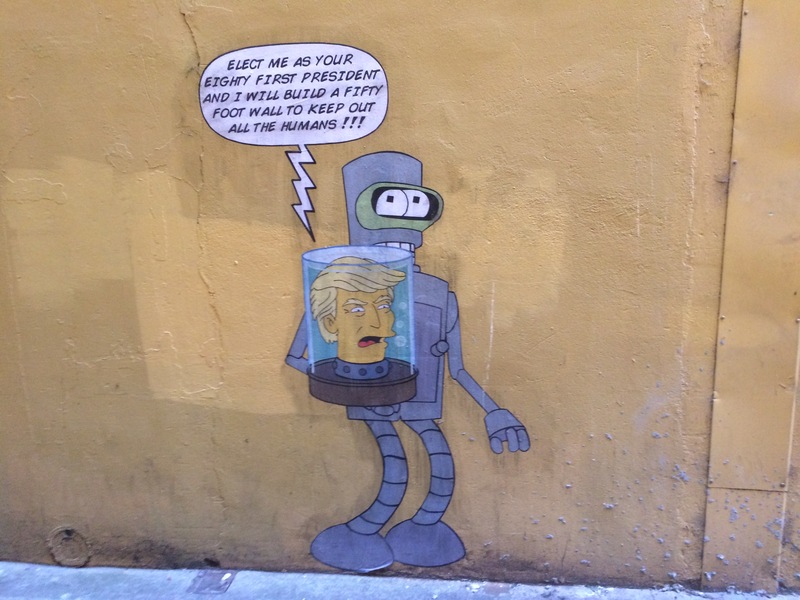 Through breaking the law, graffiti questions the laws of the city. And a way to discover the limits is for someone to push the boundaries, to trespass. 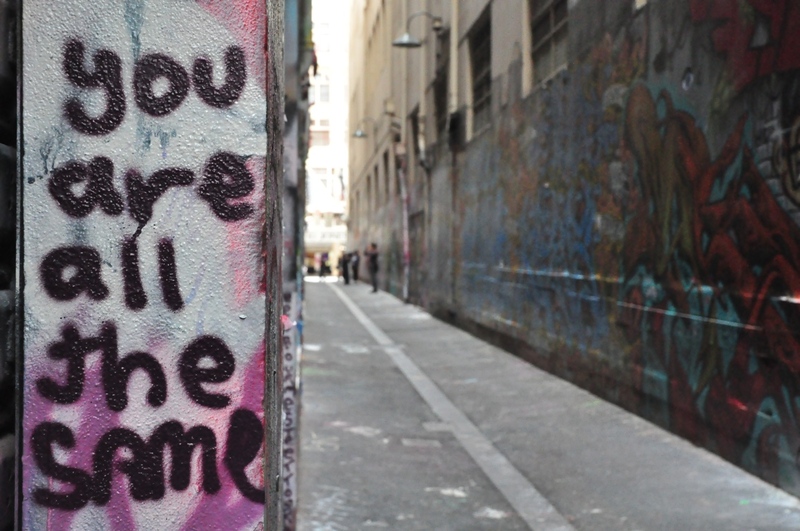 Often a generator of political and social change, Graffiti has become a big part of Melbourne’s urban landscape. 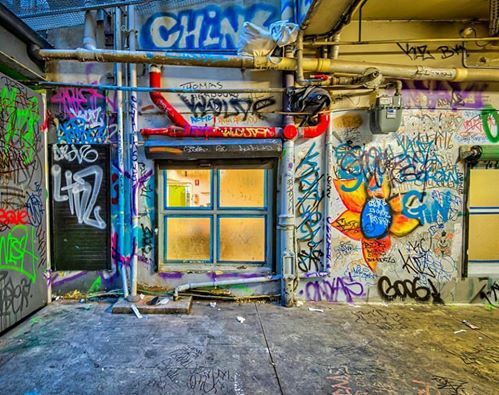 In this walk, we will take look at some of Melbourne’s best-known spots for graffiti, and discuss its social implications, reflect on the messages and ideas being portrayed, whilst exploring The Intersection’s work amongst the poor and marginalised of Melbourne. This walk is aimed at High School students in 11-12 and runs for 2 hours and costs $445 (plus GST) for a group of up to 30 students. The fees for our walks support the work of The Intersection and are necessary to help cover our costs, however we do not want them to be prohibitive. Please contact us if you would like to discuss this further.